The curriculum is based upon research in how children naturally develop and learn. 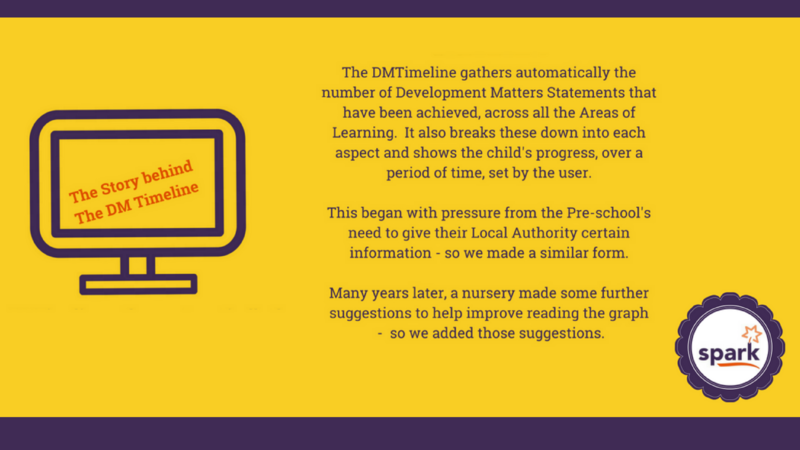 The EYFS has age-appropriate targets (Development Matters Statements) in chronological stages, organised within seven Areas of Learning. Also, there are identified strategies that lay foundations in learning techniques, which equip children in how they can learn throughout life. The targets are used to measure the child’s progress and identify how well each child is embracing different approaches to learning for themselves (Characteristics of Effective Learning). The play is the medium in which the curriculum is delivered and this is led by the children; a child-focused approach. spark has an observational journey to support the adult’s decisions in deciding the next steps in teaching and learning within the curriculum framework, in relation to each child and within the context of small groups and as a class. This observational journey supports children to achieve the Development Matters Statements (the targets) and to acquire the Characteristics of Effective Learning. 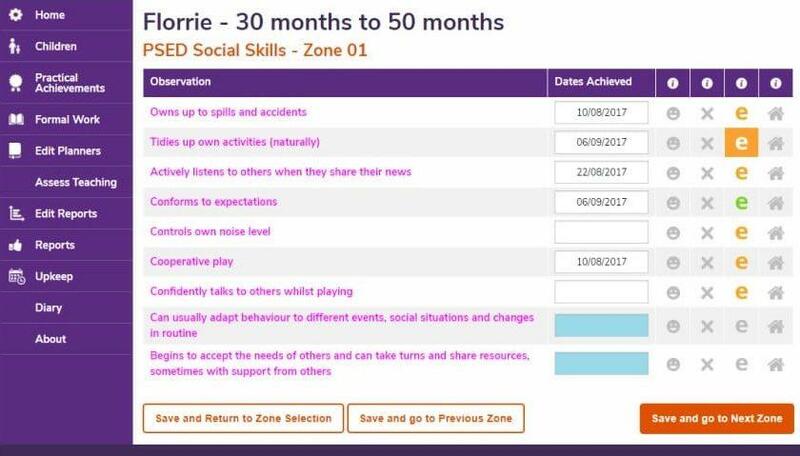 A variety of planners allows educators to organise play opportunities correlated to the next steps in the children’s personal learning journeys. The amount of progress the children make determines the quality level of the teaching and learning, that is offered. The progress made is a reflection on the levels of inspiration and stimulation that has been provided to encourage each child to accomplish their full potential. Children not achieving as they should, may show they require additional support to succeed. Teaching in the EYFS is multifaceted. Meticulous planning of the children’s learning environment, experiences and activities are very important. Children choose what they do and engage in activities where learning naturally happens for self-satisfaction, rather than to produce an end product or to gratify the adult. The educator listens and watches to pinpoint each child’s fascinations and interests. As children choose where and what they wish to play with, the educator will facilitate the curriculum, according to the appropriate next steps to be reached and to assist the child ultimately to achieve the Development Matters Statements. The area in the corner of the room is equipped with a selection of cars, vans and a road layout on a floor mat. The Floor Play Area has been displayed in this way for the last few months. Three children drive the vehicles along the roads making the appropriate noises. The child is now sharing the resources and negotiating with playmates which vehicle should have right of way at the junctions (curriculum area; Personal and Social Development). 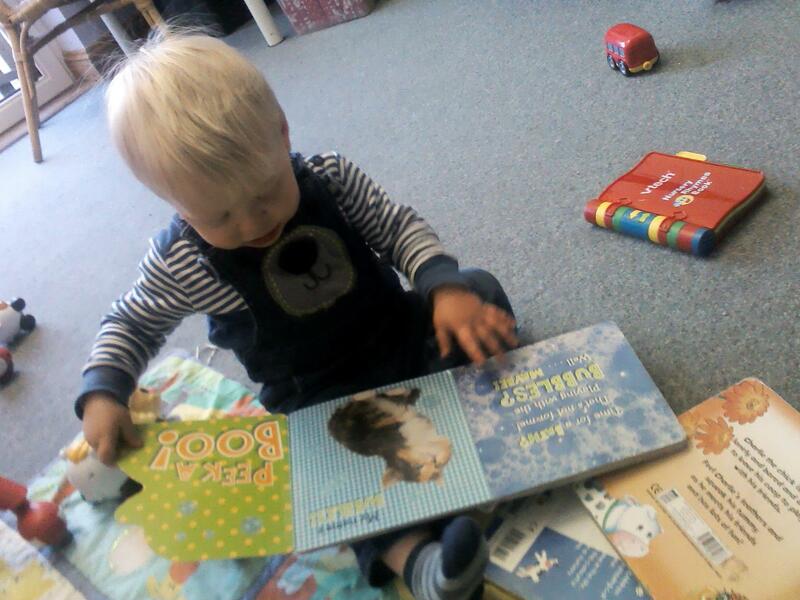 The child is participating in discussions with peers (curriculum area; Communication and Language Development). The cars are manoeuvred accurately along the roads demonstrating good spatial awareness and control (curriculum area; Physical Development). The child talks and uses prepositions, such as, “on” and “along”, also size terms, “long”, “wide” and “small” (curriculum area; Mathematics). 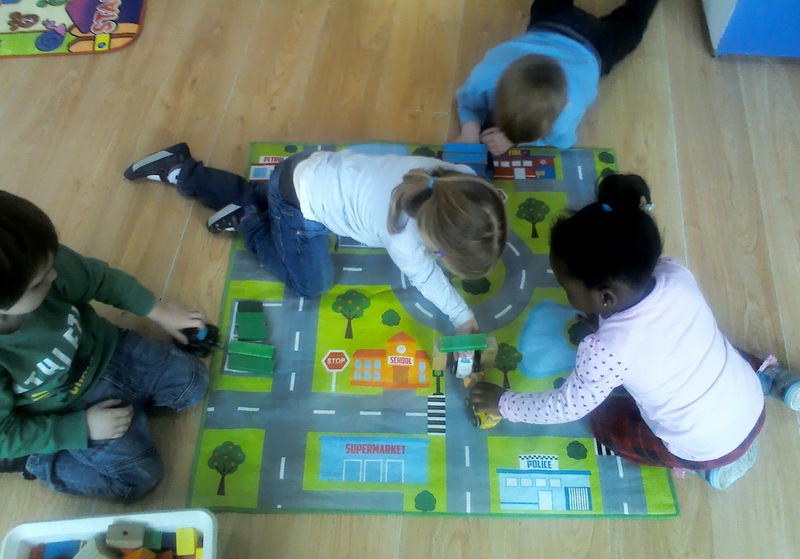 Road signs on the floor mat are recognised, such as ‘stop’ and ‘give way’ (curriculum area; Literacy) and imagination is used as the child narrates (area curriculum; Creative Arts and Design). The child’s play depicts the child’s own experiences in travelling to known places; the supermarket, school and grandmother’s house (curriculum area; Knowledge of the World). While the child is engaged in play, the adult may recognise the learning techniques demonstrated (Characteristics of Effective Learning), such as, representing their experiences in play, taking on a role in their play, acting out experiences with other people, initiating activities, seeking challenges, showing a ‘can do’ attitude, maintaining focus on their activity for a period of time, showing high levels of energy and fascination, persisting with activity when challenges occur, finding ways to solve problems, thinking of ideas, testing their ideas, enjoying achieving what they set out to do …. etc. The outcomes from the activity are quickly recorded on spark and the practitioner can also add a photo and text as additional evidence. As observations are made three things happen. Firstly, new learning outcomes (next steps) are suggested from which the educator can choose what they think is most appropriate for the child. Secondly, with spark@HOME the observation, comment and photo are instantly shared with parents. Also, spark automatically links the observations across to the Characteristics of Effective Learning attributes. Then there are instant overviews of the progress being made to view as a graph, chart or report, for the educator to evaluate progress and personal teaching practice. Some children in the group are particularly interested in transport. 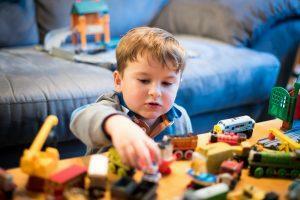 Therefore, the practitioner adds extra resources to the Floor Play Area to extend experiences and interest. A multi-story car-park, a bridge and a tunnel are introduced. These naturally extend learning opportunities. The group now need to take turns and to work with each other to share the new resources (Personal & Social Development). They drive the cars and vans up ramps, along the bridge and under the tunnel (Physical Development). The interaction with each other brings out new vocabulary (Communication & Language Development) as they describe their actions. Naturally they use more prepositions; “in”, “on”, “under”, “up”, “down”, “along”, “under”, “over” (Mathematics), they may notice signs at the car-park; arrows depicting ‘up’ or ‘down’ and words saying ‘entrance’ or ‘exit’ (Literacy). They relate to scenarios of outings in the car in relation to their own experiences of bridges, tunnels and car-parks (Understanding of the World) and continue to make up more elaborate stories as they move the objects about the floor mat (Expressive Arts and Design). Again the children practice, test and consolidate a variety of elements identified Characteristics of Effective Learning, additionally by; paying attention to details, enjoying meeting challenges for their own sake rather than external rewards or praise, showing a belief that more effort or a different approach will pay off, finding new ways to do things, making links and noticing patterns in their experience, making predictions, developing ideas of grouping, sequences, cause and effect … etc. On the basis of what the child has achieved (shown on spark), the educator identifies suitable learning intentions (next steps) from the software for children in the group. Now these are introduced into the children’s play scenario…. Joining in, sensitively with the set up the children have developed, the children’s language experiences are expanded by the practitioner. New words are introduced, such as, ‘speeding’, ‘petrol’, ‘diesel’ and referrals are made to specific makes of cars (Communication & Language Development). Through conversations, the concept of speeding is explored (Communication & Language Development) and the difference between petrol and diesel (Understanding the World). The three children listen and take turns in discussions with the educator and each other (Personal & Social Development), about road safety (Understanding the World) and the conversation diversifies slightly as the children talk about traffic lights and the sequence of the colours (Mathematics). Each car and van are identified by the colour, in the play the practitioner parks each car next to one of the same colour and the children follow suit. The vans are parked together on the top floor of the carpark (classification-Mathematics). In summary, the teaching encompasses the regular opportunities available and the enhanced resources introduced support children’s current interests. By observing and documenting progress on spark, the practitioner checks out the next learning intentions to facilitate. Through personal interaction and by organising the environment accordingly to meet curriculum requirements, the practitioner also can instantly review how well each child is progressing. This embraces progress in each Area of Learning (the current stages the child is working within and the Development Matters Statements achieved) and headway with the Characteristics of Effective Learning within the Curriculum.